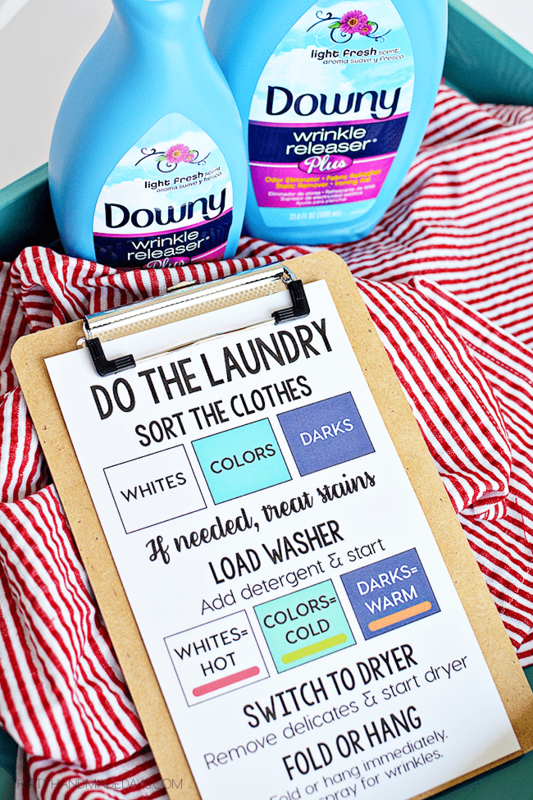 How to do laundry – teach your kids, get a refresher or help your significant other with this straight forward printable! It’s no secret that laundry has been our arch nemesis around here. I’ve posted about it a whole bunch of times in the past, always in the effort to make it easier, more efficient, etc. It’s time to get serious about our routines and making our house run smoother. Today let’s chat about teaching your kids how to do laundry. 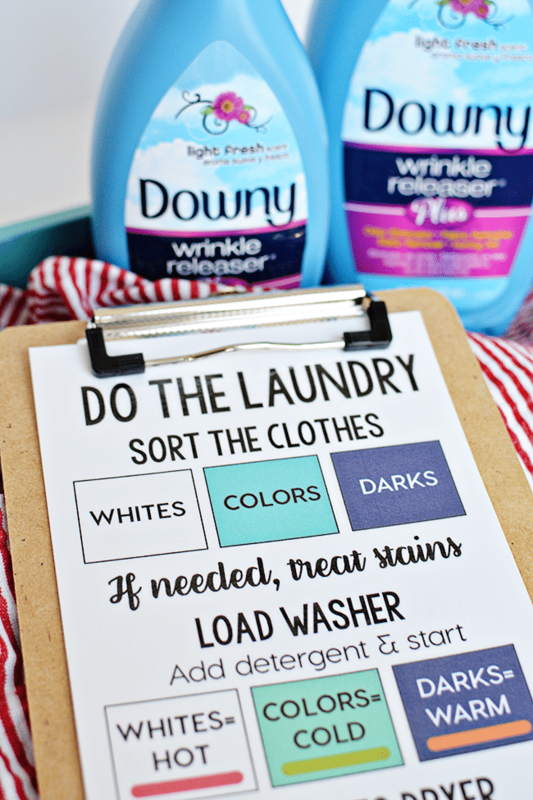 This printable is pretty straight forward — we have three laundry bins that sit in the hallway of our loft upstairs. They have different colors – white for the whites, a minty color for the colors and navy for the darks. They are expected to sort the clothes from their rooms into those sections. 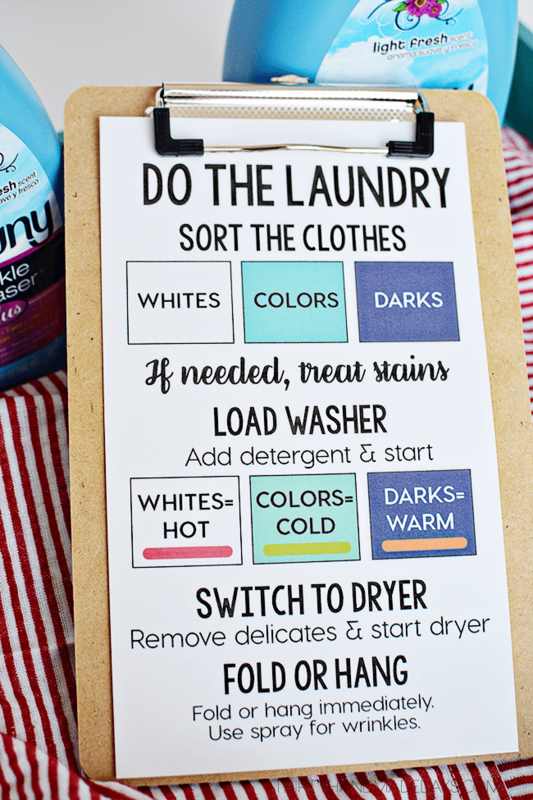 5 Laundry Systems That Work! I made this chart for them that matches those baskets (but it’s not necessary to success in this!). The chart explains what settings to put the clothes in. I have showed them which detergents and softeners to use, and where they go. We’ve talked about not filling up the washing machine too full, but also not just throwing in a few things and wasting water. Our washer and dryer have a lot of settings so I’ve gone over those as well. But every washer is different— so if you teach your kids, make sure to go over your appliances specific settings. After washing, the clothes need to be put in the dryer. There are some exceptions to that as delicates might need to be laid out to dry or hung on hangers. When clothes are taken out of the dryer, they need to be folded or hung up. But here’s the deal…. sometimes things don’t get folded and put away right away. Or they get “folded” into a ball. 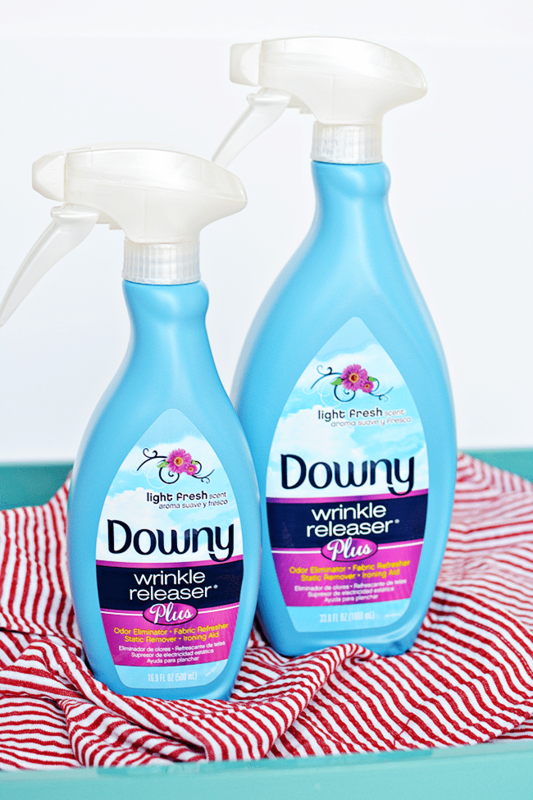 No worries- they can use Downy Wrinkle Releaser Plus to smooth out clothes, eliminate odors, refresh fabric or static and more. (and when I’m traveling it’s the perfect thing to throw in my carry on too) This will also majorly help when we’re in a rush in the mornings and want to look nice and smell good without pulling out the iron…. Bonus— there’s even a coupon for you to download so that you can try it it out for yourself! 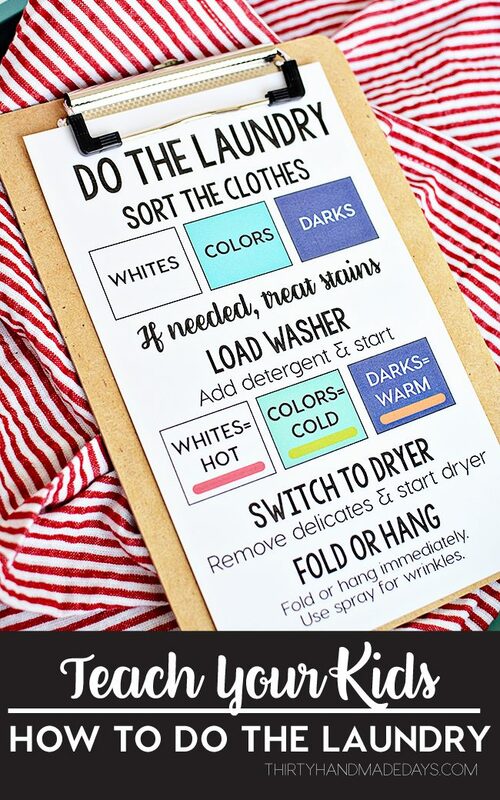 For my “how to do the laundry” printable, I ran it through the laminator to have it stay sturdy and refer to often. You can download your own copy and get to work teaching your kids too. For personal use only. I love the printable. Or just doesn’t work for our family. We only sort into whites and darks and we wash our darks in cold. Love the idea!